Asperger Syndrome is part of my world. While my son has only had an official diagnosis for a little over a year now, I suspected it for many years and wrote about it here and there. When my son started fourth grade last September, it was our first academic year with answers at the get go. I truly was thankful for answers, although I was cautiously optimistic about some things. My son began the year with a long term substitute in his classroom and we documented some items heading into our Committee for Special Education Meeting a short time after. While I will not go into our CSE meetings, I will tell you about an amazing discovery thanks to my son’s teacher that started the year. Ms. P was told about NHL’s diagnosis and we met many times to talk about things that would trigger his anxiety, stimming, and other behaviors. In addition to this, his long term substitute bought books on her own about Autism and Asperger’s. While I know they were not entirely to learn about NHL (she was in graduate school), she wanted to know more about the way he was thinking to help him in the classroom. One day, after school, she walked out with some of the books and asked if I wanted to borrow some to look over if they were new to me. One of the books caught my eye. It was actually on my list to purchase because a lot of people had recommended it. 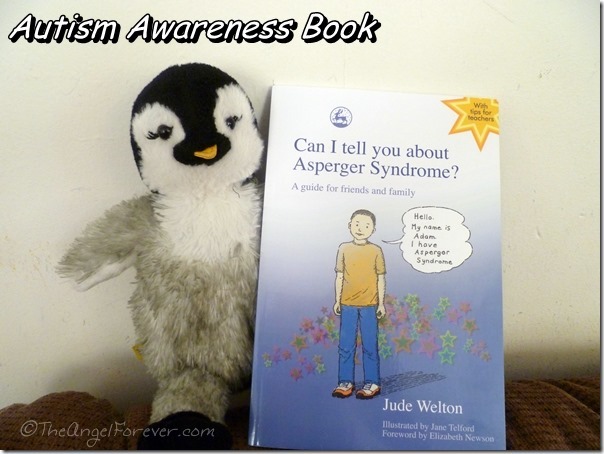 Can I tell you about Asperger Syndrome? – A guide for friends and family seriously changed our lives. The first time we read the book as a family with the boys. Each time, we would stop to talk with NHL and he would weigh in on how things were similar to his feelings. I highly recommend reading the book with a newly diagnosed child to ease their fears of new buzz words that they may be hearing from the adults in their life. As a parent not on the Autism Spectrum, a light bulb went off in my head as we read. Not only did it really explain things in terms for children, it would be a great book to share with our family members and possibly to gift to teachers in the future that will work with my son. Author Jude Welton has an Aspie son and wrote this book to help children 7-15 years old to understand the challenges that children with Asperger Syndrome face. The book explains what Asperger Syndrome is, what it feels like to an Aspie child living in a neurotypical world, and how they can assist. 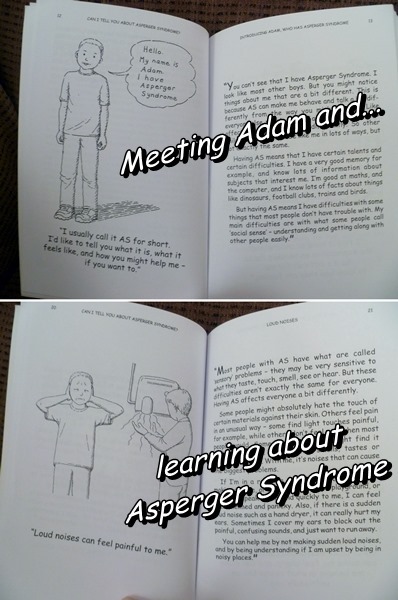 Each section of the book has a cartoon drawing of Adam on the left side by illustrator Jane Telford. With each of the drawings, there is a statement from Adam. The right side of the page continues explaining items in simple terms that children and adults who are unfamiliar with the Autism Spectrum will understand. In addition to these areas, there is also a section about Asperger Syndrome, suggestions on how to help children, and specific pointers for teachers. Welton has also included other recommended reading, websites, and organizations at the end of the books. The book really is a fantastic resource that we have loaned to our family and some individuals that work with our son. I do believe I am going to be buying a copy to leave in our school as a donated resource for the future. If you have other book recommendations about autism, please be sure to let me know. As always, Tuesday Tales is all about sharing our love of books. Please let me know what you have read recently. Be sure to link up to your book posts in the comments below. Include something you read on your own, with a child, or someone else.